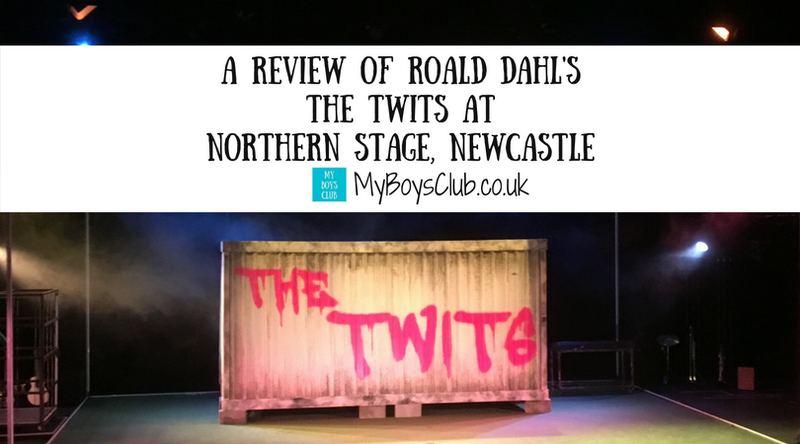 Once we heard that The Twits live theatre show was coming to Newcastle’s Northern Stage theatre, we knew we wanted to go and see it. James and the Giant Peach was magnificent last year and we’d spent much of 2016 celebrating Roald Dahl that this was a must. We had been invited along to the opening night by Northern Stage but also bought extra tickets so the whole family could go together. We went straight from school, parked easily in Claremont Road Car Park (£1.30 per hour between 8 am and 6 pm) and walked along to Northern Stage to pick up the tickets and have tea. 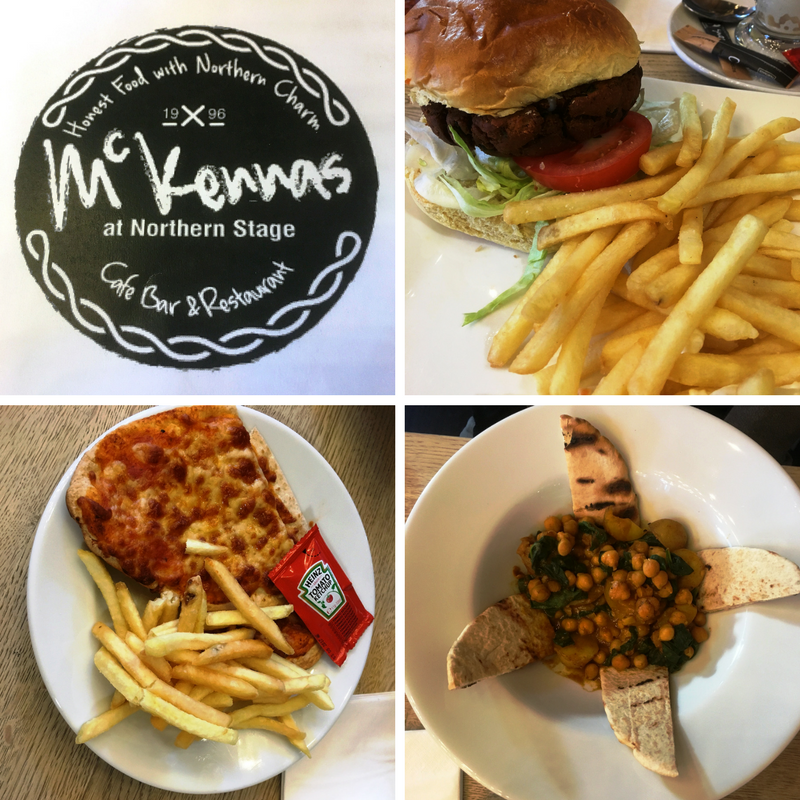 We ate in Mckennas at Northern Stage - Pitta Pizza & fries x 2 (V), Chestnut Mushroom & Spinach Burger (V) and McKenna's Famous Moroccan Spiced Chickpeas (Vegan). Kids meals are £3.95 and include a drink, with our mains £7.50 and £7.95All delicious! As it’s a sell-out, not surprisingly the place was buzzing and the boys kept spotting school friends too. But on to the play. We had a great view, mid-way back and centre of the row, not that there really is a bad view at Northern Stage. And the show began. The Twits stage show is based on the book by Roald Dahl and adapted for the stage by the director, David Wood. 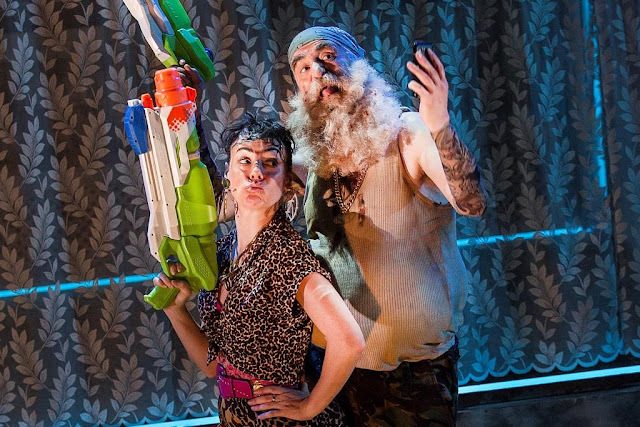 This production was by Curve and Rose Theatre, Kingston and is at Northern Stage from Tuesday 21 March to Saturday 25 March – it has been so popular that an extra performance had to be added to the Saturday date. The story, as many people know from reading the book, tells the tale of the most spiteful and revolting couple you could ever hope to meet. Mr Twit has a very hairy face. His beard is spiky and smelly. It also contains cornflakes, sardines and even some stilton. Mrs Twit is equally as foul and she hates Mr Twit just as much as Mr Twit hates her. They spend their days playing wicked tricks on each other and mistreating Muggle-Wump monkeys. They also have a particularly sticky trick to catch Roly-Poly birds for their bird pies. But not for much longer because the monkeys have a cunning plan to teach those terrible twits a lesson. The show has a great energy to it. Every child and adult had a smile on their face, shouted out, followed instructions and from what I could see thoroughly enjoyed themselves. 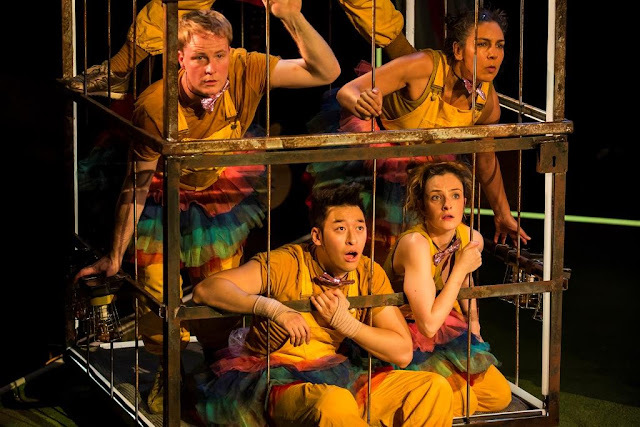 There is acrobatics, singing, stilts, dancing, music and a great narrative, all performed by just a cast of seven people. 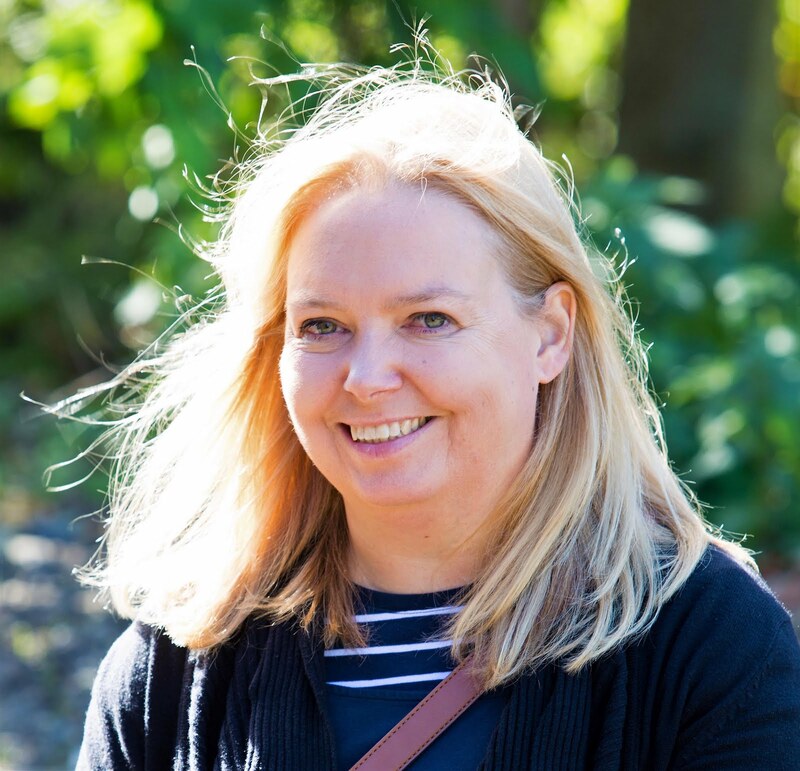 It is interactive in ways that you would imagine – singing, Mexican waves, responding to characters, water pistols and helping the monkeys but also in ways that you wouldn’t imagine too with unexpected audience participation. I’m just going to say shoes! At the end, there was an impromptu question and answer session with the cast which my boys were keen to stay for. This I have to say was nearly as entertaining as the show itself. Children really do ask the best questions. Are you really that fat? Is that a real beard? Do you like drinking out of the toilet? I was very proud of my eldest for asking a question from the audience – he asked the final one directed at Mr & Mrs Twit – Are you married? The reply in true theatre style, came back in unison from the characters, Yes, but not to each other. And on that note, we went home very happy. Good food, a good show and lovely evening out altogether as a family. After an evening at Northern Stage, I can definitely say that Roald Dahl's despicable Twits have Phizz-Whizzed their way to Newcastle. What is your favourite Roald Dahl story? I remember reading and loving this as a child! It's a shame my two are a little too small for this. I'm really excited after reading this. 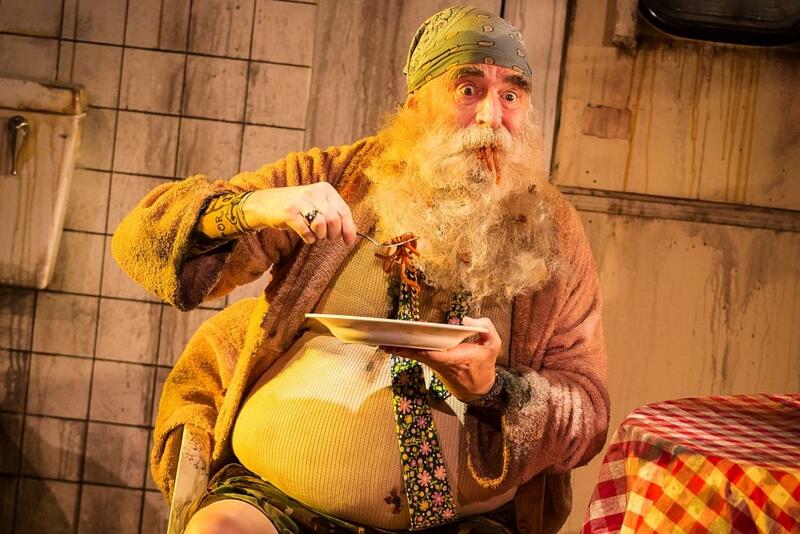 We're going to see The Twits at the Rose Theatre soon. I can't wait! I've also been running a competition on my blog for tickets to the show at the Rose. Like with you there, it's proving pretty popular....thanks for linking up with #CulturedKids!